Oh No! Your Rankings Dropped! 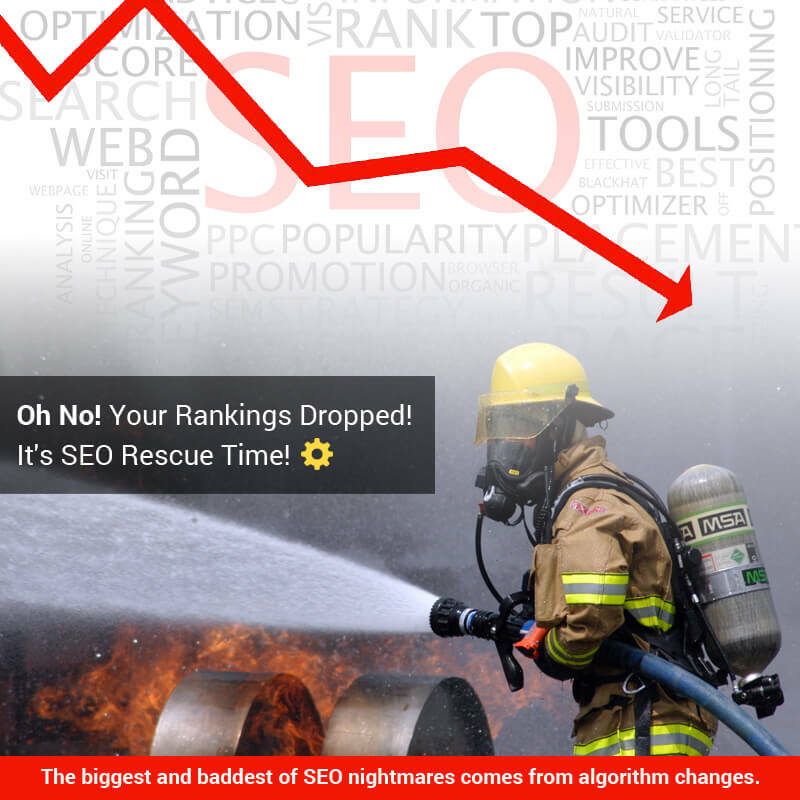 It's SEO Rescue Time! Oh No! Your Rankings Dropped! It’s SEO Rescue Time! They say nothing remains the same, and that especially goes search engine rankings. A drop in one’s rankings can be the result of one or more factors and if you don’t know your SEO, then you’ll have a hard time figuring out what’s going on. As mentioned, there are several factors that could be at play and knowing what they are can be the difference between success or failure. The biggest and baddest of SEO nightmares comes from algorithm changes. At Google alone there are hundreds of such changes per year. Their engineers are the best in the business and when they update it could mean a mild change in your rankings or a massive one. You need to be on the lookout for such updates but even the best SEO experts can’t tell when these things are going to happen. They just sit back and monitor their statistics until they see the good or bad news and then get to work on remedying the situation. Another problem is when you alter your website. Believe it or not, sometimes a modest change can result in devastation. Usually the bad news happens when you decided to change the design of your site. If your site is doing well, don’t futz with it. Who cares if your girlfriend or child or husband figures you need a new website design. If your website is doing well, leave it the heck alone. Focus more on adding updated content that can incorporate your standard keywords, keyphrases, and keygroups and any new ones instead of throwing things off balance with a new and useless design. If you have change the design, just change the design but keep you content in place on the same pages with the same links. Your site might drop down for a few days or a few weeks but it should bump back up to normal or within normal ranges. Perhaps the new design allows for better load time and your site will rank higher. Clean up your links. If you’re using that old style low level linking lists that you bought that links dozens or hundreds of sites to you, get rid of them. Rely only on big sites with authority. Do whatever you can legally do to get these kinds of links. It shows Google that your site is considered interesting by the people who are looking for the best in your business niche. Competitive overwhelm. Sometimes your competitors can do something efficient to their sites that give them extra power with the search engines. You can get overwhelmed by this and you need to act fast to keep your place. Look at what your competitor’s sites contain. Do they have better pics and videos? How about copy? Is their copy superior and engaging to yours? How about social media? Do they have a social media option that allows for greater reach and promotion? If so, you need to get back to the drawing board and do some fixing up and fast. Another thing you might notice is that for some time you’ve been looking at the wrong rankings regarding your site. People are getting more savvy at how to type in a string query. So is the software. People might have normally found your site by typing in “dog grooming in Seattle, Washington” and your site would be on the front page of Google for this query. Now, people have stopped typing that and instead are typing in “best dog grooming service located in Seattle, Washington, US”. These things you have to look out for as tiresome as they may seem. So if your rankings are slipping now and then, it’s just part of the roller coaster ride of the SEO game. There are things you can do to prevent and remedy things and hopefully these tips can help.